Defence Secretary Des Browne has denied that UK troops in Afghanistan are under-resourced after a plane crashed near Kandahar, killing 14. The government had not underestimated the dangers involved, he told the BBC. 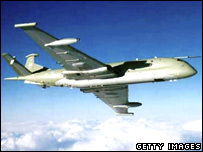 The RAF Nimrod MR2 crashed on Saturday, killing 12 air personnel from 120 Squadron based at RAF Kinloss in Scotland, a Royal Marine and a soldier. An inquiry has begun to find out why the reconnaissance aircraft came down. A technical fault has been blamed. He said the Nimrod aircraft had a good safety record and was maintained to very high standards. Mr Browne also rejected criticisms that his predecessor John Reid had misjudged the dangers faced by British troops. Group Captain Chris Birks, station commander at RAF Kinloss, insisted all safety procedures had been followed and the aircraft which crashed had not been overworked. "We will always fly as required for operations. "We have limits set that we do not exceed, and that certainly has been the case in the operations that we are flying in the Middle East and at home." He paid tribute to the dead men, describing them as "first class personnel". Mr Browne also paid his respects to those who had died, and dismissed claims by the Taleban that militia had shot down the plane. He said: "The Taleban regularly make claims which we know to be untrue and I think in this case, this is instructive of the nature of their dishonesty. "In Afghanistan, we have secured the site and the investigation has begun." Major Luke Knittig, a spokesman for the International Security Assistance Force (Isaf), said the aircraft, which had been acting in a support role to the Nato-led force battling the Taleban, had made an emergency call shortly before it disappeared. Coalition helicopters were reportedly seen flying to the scene of the crash, about 20 km (12 miles) west of the city of Kandahar. Aviation journalist Jim Ferguson said the reconnaissance planes had been operating in the country for some time. "It is used a lot for search and rescue and it may well be doing other interesting tasks out in Afghanistan." The crash brings the death toll of UK forces personnel in Afghanistan to 36 since the start of operations in November 2001. Afghanistan is experiencing its bloodiest period since the fall of the Taleban in 2001, with much of the fighting concentrated in the south. There are 5,500 British troops in the country, helping to train Afghan security forces, facilitate reconstruction and provide security.